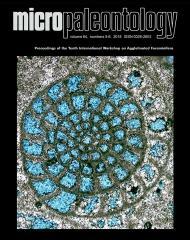 ABSTRACT: Anew larger benthic foraminifera is here described as Neodubrovnikella maastrichtiana n. gen., n. sp. from thin-sections of the upper Maastrichtian Tarbur Formation of southwestern Iran (Zagros Zone). This Maastrichtian genus is homeomorphic to the Middle Jurassic Dubrovnikella Schlagintweit and Velic. Differences are due to the type of foramina and the coarseness/fineness of the pores in the wall. Neodubrovnikella n. gen. represents the second taxon ascribed to the Biokovinidae besides Zagrosella Schlagintweit and Rashidi due to the presence of a pseudokeriothecal wall texture. Representatives of this family exhibited a latest Cretaceous "revival" before finally becoming extinct at the K/Pg boundary. In agglutinating conical forms however the pseudokeriotheca may be still present in the Early Paleogene.